The Republican-controlled Congress and the Trump Administration, for example, may have offered a half-a-loaf campaign recently to deal with the opioid crisis. But analysts say it is not nearly enough, especially in dealing with evolving overdose fatalities. They grow in scary ways due to synthetic opioids like fentanyl, a drug deemed 100 times more potent than morphine. Fentanyl too often is cut into or used with lethal effect in illicit and ever-more widespread street drugs like heroin. The Upshot, the New York Times’ evidence-based column, reported that fentanyl fatalities grew from 3,000 in 2013 to 28,000 in 2017, a year in which fentanyl overdoses alone rose by more than 45 percent. 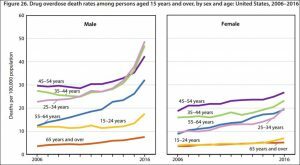 The recent increases in drug overdose deaths have been so steep that they have contributed to reductions in the country’s life expectancy over the last three years, a pattern unprecedented since World War II. 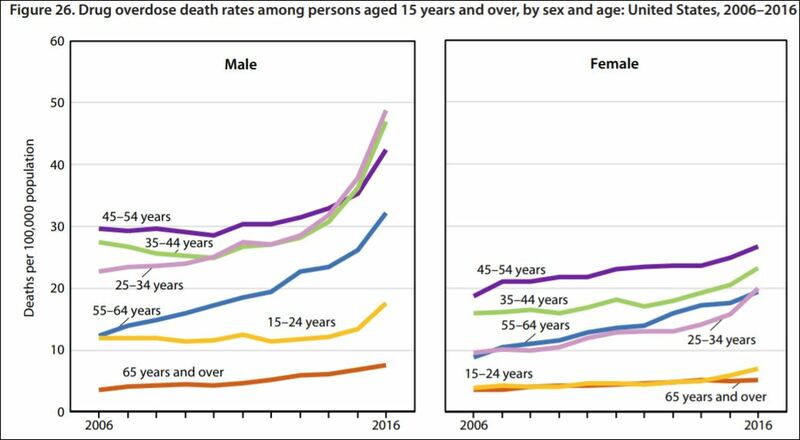 Life expectancy at birth has fallen by nearly four months, and drug overdoses are the leading cause of death for adults [younger than] 55. [The numbers] continued the longest sustained decline in expected life span at birth in a century, an appalling performance not seen in the United States since 1915 through 1918. That four-year period included World War I and a flu pandemic that killed 675,000 people in the United States and perhaps 50 million worldwide. The [suicide] rate in the most rural communities is 53 percent higher than in 1999. The rate in the most urban communities was 16 percent higher. More than half of suicides are committed with firearms; rural Americans are much more likely to have a gun in their homes. In 1999, about 46,000 Americans died of either suicide or drug overdoses. In 2017, more Americans than that died of suicide alone. In my practice, I see not only the harms that patients suffer while seeking medical services but also the damage done to them by dangerous medications, especially the epidemic of opioids and their deadly follow-in synthetic and illicit drugs. Big Pharma, and its witting and too-often gullible allies — including over-prescribing doctors and profit-seeking hospitals and insurers — plagued the nation with aggressive advertising, marketing, sales, and distribution of opioids. Makers flooded poor, struggling, rural, and ex-urban areas with tens of millions of unneeded and harmful opioid doses, addicting the young, jobless, and those with dimming hope. Drugs have debilitated and killed them, as have too easy access to guns. Our suicide rates, as with overdoses, have become a public health crisis, wrapped up in needless shame and destructive myths. Amphetamine-related hospitalizations jumped by about 245 percent from 2008 to 2015, according to a recent study in the Journal of the American Medical Association. That dwarfs the rise in hospitalizations from other drugs, such as opioids, which were up by about 46 percent. The most significant increases were in Western states. The surge in hospitalizations and deaths due to amphetamines ‘is just totally off the radar,’ said Jane Maxwell, an addiction researcher. ‘Nobody is paying attention.’ Doctors see evidence of the drug’s comeback in emergency departments, where patients arrive agitated, paranoid and aggressive. Paramedics and police officers see it on the streets, where suspects’ heart rates are so high that they need to be taken to the hospital for medical clearance before being booked into jail. And medical examiners see it in the morgue, where in a few states, such as Texas and Colorado, overdoses from meth have surpassed those from the opioid heroin. This is unacceptable, and we have much work to do.